, ESPN announced last week that it would, for the first time in Australia, be broadcasting localised coverage of the major sporting event. Airing today, the game between the New England Patriots and the Los Angeles Rams is set to include 40 hours of live programming from Atlanta, as well as an Australia/New Zealand 30-minute pre-game show starting at 9.30am. Head of Disney ESPN media sales and partnerships, Nik Weber, told AdNews he hopes the broadcast will highlight the value of major American sporting events to advertisers. According to ESPN, the channel's main demographic is the lucrative 16-39-year-old bracket, which is something Weber believes will contribute heavily to further ad sales growth in 2019. "It's an age that's really hard to reach, particularly in free to air at the moment, so when we're talking to brands and they are trying to attract that younger male audience, it's a really good fit and something we will continue to target throughout the year. Weber said ESPN found the Super Bowl opportunity "too good to pass up", signing on a list of major brands including Mercedes-Benz, Subway, NIB, Holden, BFGoodrich and Marvel Studios’ Captain Marvel. The broadcast itself is fully integrated, which also includes a dedicated commentary team for the Australian audience, as well as typical "spots and dots" during ad breaks. Weber said brands such as Mercedes and NIB have their own unique integrations, with NIB taking on the 'injury report' segment, while Mercedes will act as the presenting partner, linking in with fact the game is being played at the Mercedes-Benz Stadium in Atlanta. "Where we feel that we add the most value to our partners is by integrating them into the really premium broadcasts and bringing the scale of ESPN to Australia," he said. "We really wanted to work out exactly how we were going to derive additional value for our partners. 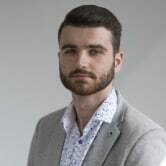 So we put a lot of time into researching how it could look, what integrations could be, how we could contextually implement the partners across the broadcast." Weber said over the past four months since taking the team in-house, significant investment has been made to upskill and grow a localised team dedicated to improving the level of television ad sales it currently offers in market. "One of the key things we really wanted to be able to do was figure out a way to weave our advertising into the narrative of the broadcast that we were putting to air," Weber said. "We'd always been fundamentally challenged doing that because we were just taking straight feeds from the US. However, having the opportunity to do our own broadcast for the Australian and Pacific audience allows us to now integrate our partners better." ESPN is expecting the broadcast of this year's Super Bowl to prove the value of the channel locally, as it looks to invest into other major American sporting codes, including the popular NBA Finals, which continue to attract Australian audiences as interest in the code builds locally. "We're very excited about diversifying and broadening our reach here. That's why we've recently launched SportsCentre in Australia which we broadcast on Thursdays and there's a lot of other content in the pipeline that's specifically for local audiences with an authentic ESPN tone that we're ready to get moving on," Weber said. "This is a great case study for us as a business to really dive deeper into content production for the Australian audience. Speaking broadly, the NBA finals this year are shaping up to be a fantastic event and I'd love to be doing more with our partners across the NBA." ESPN is currently a channel partner of Foxtel, appearing on channel 508. When it comes to free-to-air coverage, Seven currently holds the rights to the broadcast, airing it on its multichannel 7Mate. To see the big international brands backing the Super Bowl this year, check out our brand wrap. L to R: ESPN senior manager content and operations John Webb, MNF’s Booger McFarland and Joe Tessitore, ESPN's Nik Weber and national sales manager Ross Emmerick. ESPN has revealed to AdNews that its localised coverage of the 2019 Super Bowl will act as a "launchpad" for further sales growth for the channel in Australia and New Zealand. 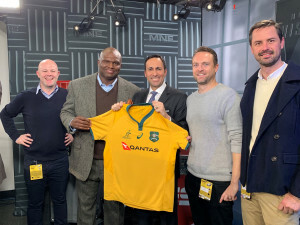 After taking its sales team in-house and ending its long-standing sales partnership with Seven, ESPN announced last week that it would, for the first time in Australia, be broadcasting localised coverage of the major sporting event.